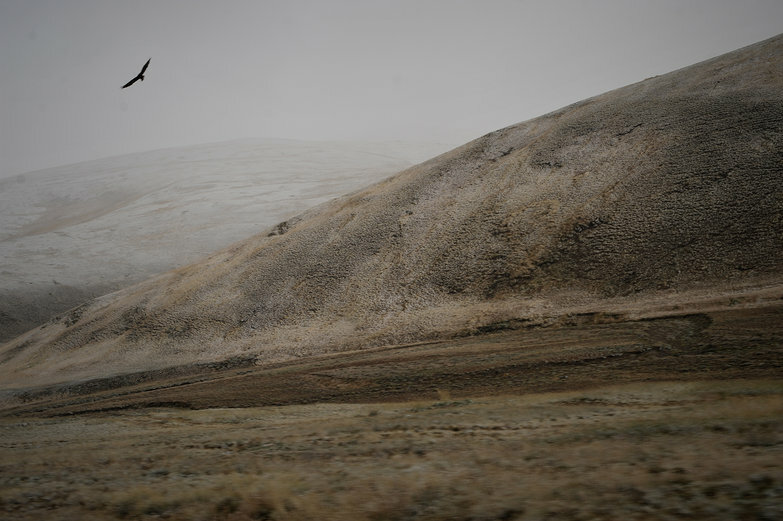 The wind is blustery and wintery, whipping through the mountains and flying across the plains as we head closer to Mongolia. It smells like snow. As Tyler drives, I realize I've missed this particular seasonal odor and the chilly expectations that come with it. It feels slightly premature though, it is only September! Nevertheless, the weather is definitely changing. The climate isn't the only thing in flux, however. 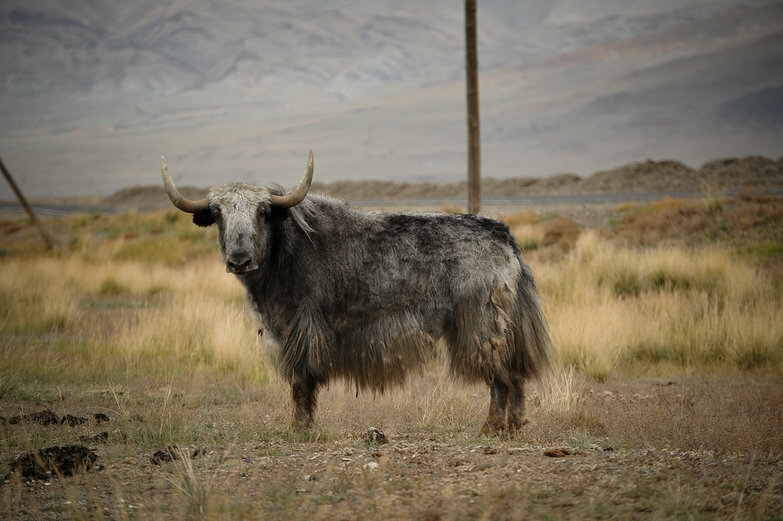 When we spot a mammoth woolly yak, we can hardly contain our excitement. The land around us is shifting, preparing our entrance to a new country as it always does, yielding obediently to the arbitrary lines on our map. The villages we are passing have a ragged look we haven't seen before. One town advertises its sole ATM with a large sign, placed several kilometers in advance. Another makes sure to point out that the next is very, very far away. Almost to the Russian border town of Tashanta, it is getting late. Or at least, it feels that way. Though it is just shortly after five, the overcast skies are threatening an early darkness. The sun has fought a losing battle today. As we navigate the smooth highway, occasionally taking off-road detours around sections that are under construction, we pass a couple of Mongol Rally cars, also driving towards the border! As we overtake them, we wave hello, noting the UK and GB stickers plastered on the cars. It is comforting to know that other English-speaking foreigners are in this remote corner of the world, plying the same road as us on this cold, strange evening. A short while later, we roll into Tashanta. The wind is howling now, this time bringing with it our first icy flakes of the season. It is snowing! Within seconds we've driven the entire length of the tiny settlement and find ourselves at the border! Now faced with a gate and uniformed guard, we are instructed to go back a few hundred meters. Apparently we've missed passport control. We thank the female guard and turn around, heading back to a tiny grey building that has a small paper sign affixed to it. The simple sheet of printer paper indicates in Times New Roman that we should stop here to get our passports checked. While Tyler parks the car, I open the door, exiting our climate-controlled surroundings into what has become a bitterly cold dusk. The flurry is exhilarating though, and it makes me happy as I run into the grey building. I love snow! Inside, a young, very Asian-looking man wears a newsie hat, waiting with a kind, quiet smile. The room is dark, lit only by a small lamp whose base is three pastel, porcelain dolphins caught mid-leap. The lamp's single bulb illuminates the desk alone with its orangey glow. The gentle man asks for our passports, and calmly looks through them, examining our registration papers in detail. He organizes and stacks the very important documents, then staples the mess together and files them away. He enters our information into some sort of database on the computer. Tyler has joined me by now, and notes that the computer has no network or telephone cables attached to it. We wonder if this information will ever been looked at again. When the man is done, he stamps our passports, and hands them back with a smile. That was easy! Next, he escorts us out into the cold and points to our next checkpoint: customs. But hurry! he says, pointing at his watch, the border is closing soon. We run to the control, and find ourselves in an office with a friendly woman who speaks very good English. "Does it always snow here this time of year?" I ask her. "I don't know! I just moved here," she says with a laugh. Then, she turns to her co-workers to find out. Apparently the blizzard we now find ourselves in is perfectly normal. The declaration papers are in Russian, so the young woman helps us fill out our forms. It only takes one try this time around! With all of our Is dotted and Ts crossed, we sign at the bottom and are ready for a car inspection. The border officials take one quick glance in the trunk, and we are ready to go. But first, we wait for the Mongol Rally teams. It seems the officers only want to open the massive gate once before the border closes officially. Everyone appears anxious to get home; the guards and staff are all packing up. Eventually the other teams: a big red boxy car, a London taxi, and a Jeep, are ready as well. A man unlocks the metal gate and slowly heaves it open. Stretched out before us is a vast space with nothing as far as the eye can see, save for sheets of blowing snow. One by one we start our cars, heading into the wild unknown! We assume that we've done both the Russian and the Mongolian border checks in one fell swoop, and that we are now in Mongolia. After about forty kilometers of driving, however, we dead-end into another border gate. A single man with a rifle slung over his shoulder is manning the barrier; he comes running over to greet us. The soldier is clearly freezing, shivering in biting cold. He looks eager to go home for the weekend. I feel sorry for him as we dutifully offer our passports for another inspection. After a cursory glance, he hands them back and asks if he can bum a cigarette (we don't have any). After he opens the gate, we all file through the opening. Looking back as we pull away, I watch the lone man closing the gate behind us, barely visible in a whirlwind of snow. Onwards we drive, now part of a convoy traveling into nowhere. We haven't shared more than a brief hello with these people, but there is some unspoken connection between us all. We're the last group of the day to cross the border, and we're all out here together. The temperature continues to drop, the scenery becomes more barren. We are tingling with excitement, driving with the windows down and the heat up, feeling very, very small. A few more kilometers down the road, we meet yet another gate. More men with rifles, more passport checks, and one more metal grate to slide open. 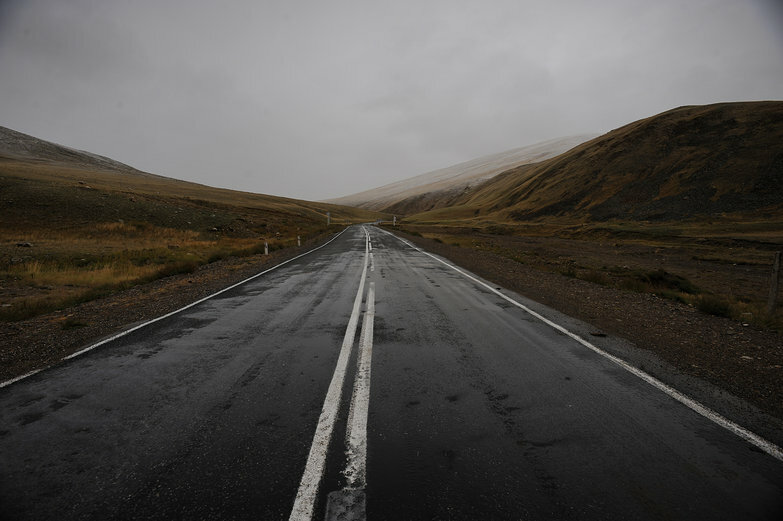 This time, as if acknowledging that we've finally entered Mongolia, the road disintegrates. We are now on a rutted dirt track, heading into the mountains. Our convoy comes to a halt after a few kilometers, cars parked one behind the next in a single-file line. Before us is one final gate. This one is bigger that the last, un-manned, and firmly, officially secured with a thick padlock. Behind the bars are a few large buildings. We get out to investigate. It seems we've been in no-man's land this whole time. This firmly locked gate must be the real border to Mongolia. When the final car is parked, we all get out of our cars and spring to action, a newly-formed team. We're out here, in the middle of nowhere, locked in no-man's land between Russia and Mongolia, in what we will later discover is a -20°C blizzard. We have to work together. While we quickly learn everyone's names (Richie and Freddie in the Suzuki Jimny; Mu, Charlie, and Tim in a Carbodies Taxi; and Mette in the red, boxy Fiat Doblò), Mette and Richie take action, yelling through the gate, pounding on the cold metal bars. There is one soldier on the other side and we all join in, trying to get his attention. The man seems unconcerned by the site of us pounding on his gate, but eventually, he comes to let us in. Thrilled, we all hop back in our cars, start them up, and drive inside. Now we're in the Mongolian border area, with that massive gate firmly locked behind us. 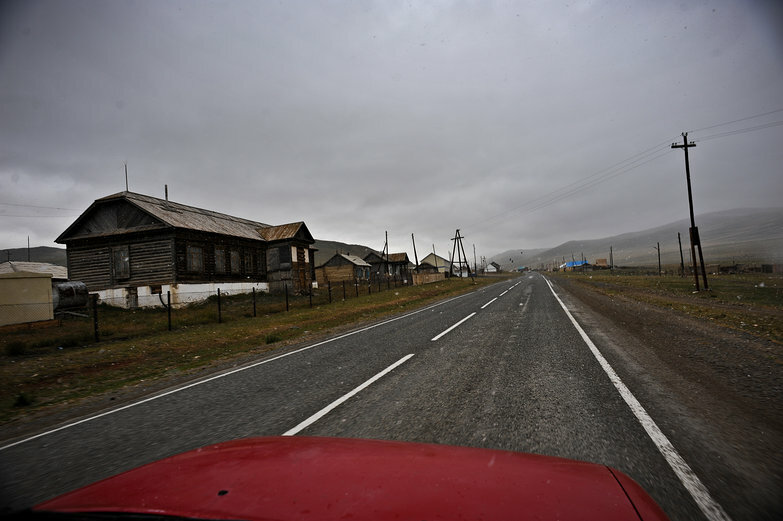 The town of Ölgii is only about fifty kilometers away; once we're done with customs and inspections, we'll be able to get a hot meal and a warm place to spend the night. The guard comes by each of our cars to collect our passports, to rush us through the customs process. All of them in hand, he runs ahead of us, towards a little office. 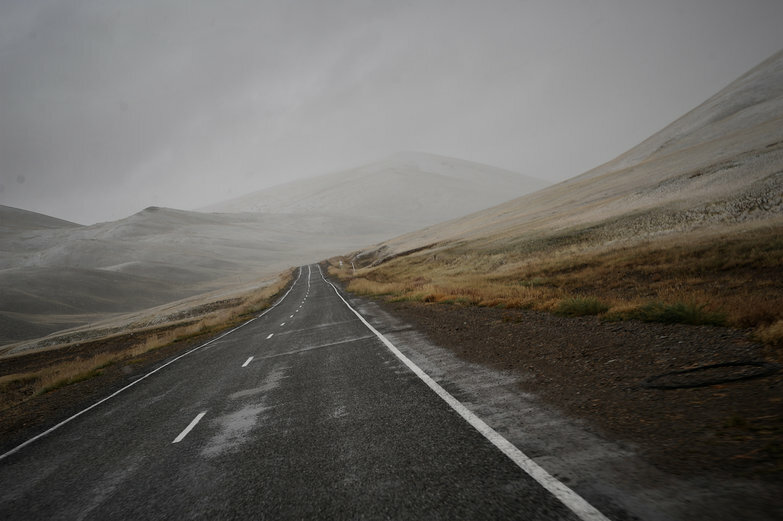 We're almost to Mongolia! Then the man stops running for a moment, and turns around to face us. He puts the palms of his hands together against his cheek in a "sleep" gesture, then points to where we are. Wait… what? I feel my heart plummet into my stomach and my mouth grow dry. Is he saying we're supposed to sleep here? We're stunned, unable to move or speak. We're still not sure what is going on, but we watch as the man does an about-face and start sprinting again, with our vital identification in hand. 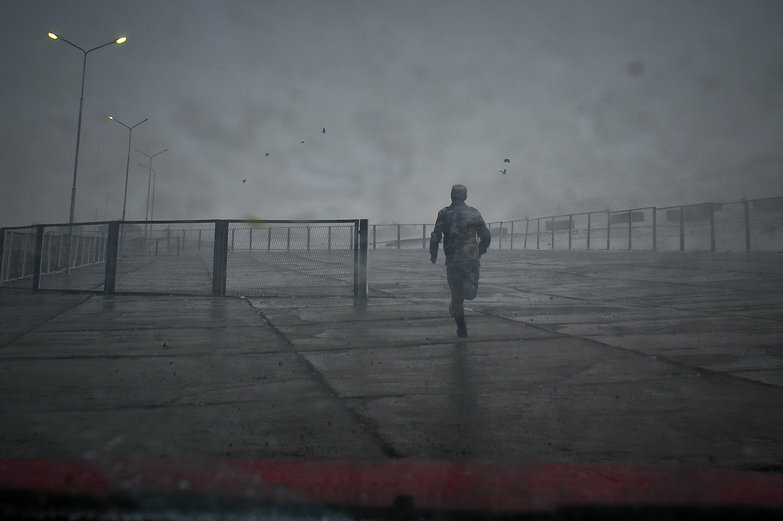 Time seems to run in slow motion as I stare in horror: he reaches the gate (this one really opening into Mongolia), lets himself through, and runs off, into the night. Ack! I can't stand the suspense! Good grief! This adventure just took on a whole new dimension! That must have been and odd and exhilarating feeling to spend (even a little) time in the space IN BETWEEN countries. It's like you were on the line on the map. Maybe it was more fun once you made it all the way through. Btw, you're killing me with this cliffhanger. Post the next one! Post the next one! the suspense is worse than an episode of lost!! Well, clearly we won't be getting an update until they get to Ulaan Baator. Which, barring....blizzards, sandstorms, highway robbery, and who know what else, should be fairly soon. My heart is in my mouth reading this back! Though I have a fairly good idea what happened next.